Tired of mis-cut keys due to outdated equipment? The DC-300 combines extreme accuracy (one -half thousandth of an inch) with a simple space key and depth cam system. The DC-300 can both code cut keys as well as duplicate, saving money by utilizing one machine to do both jobs. Easy To Use To code cut keys on the DC-300, insert the proper space key and depth cam into the machine. Turn the depth cam to the proper depth, line up the space key with the proper space position, and push the carriage forward to make the cut. Repeat this procedure for the rest of the cuts on the key. Keys can be code cut in less than 30 seconds. Duplication Is Even Easier Turn the depth cam to any number 1 depth on any cam. Insert the original and blank key, and push the carriage forward to make each cut. Duplication takes less than 20 seconds. The DC-300 also features a deburring brush, available in wire or nylon. Saves Money Since the DC-300 can both duplicate and code cut, there is no need for two machines. Both tasks are easily done on one machine! 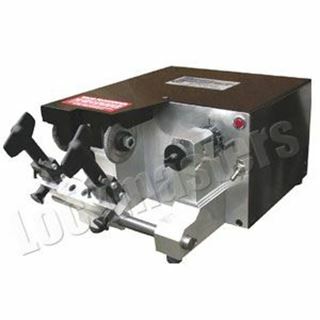 Highly Accurate The DC-300 is precision engineered, and is constructed of steel and aluminum. The machine rarely needs to be adjusted, and holds tolerances of .0005.” Sealed ball bearings are used throughout the machine, ensuring years of use. The only maintenance required on the DC-300 is a regular cleaning and few drops of lubricant on the slide rod and depth plunger. Easily Updateable As new code series are introduced, the DC-300 can be easily updated. In most cases, only a space key is required. Occasionally, a new depth cam will be needed as well.